Spring is settling in and, the long-missed sun is triggering a boost of energy, happiness and eagerness to unwind, become active and explore… all of it while enjoying the sunny weather. This leads to panning and enjoying lots of outdoor activities. 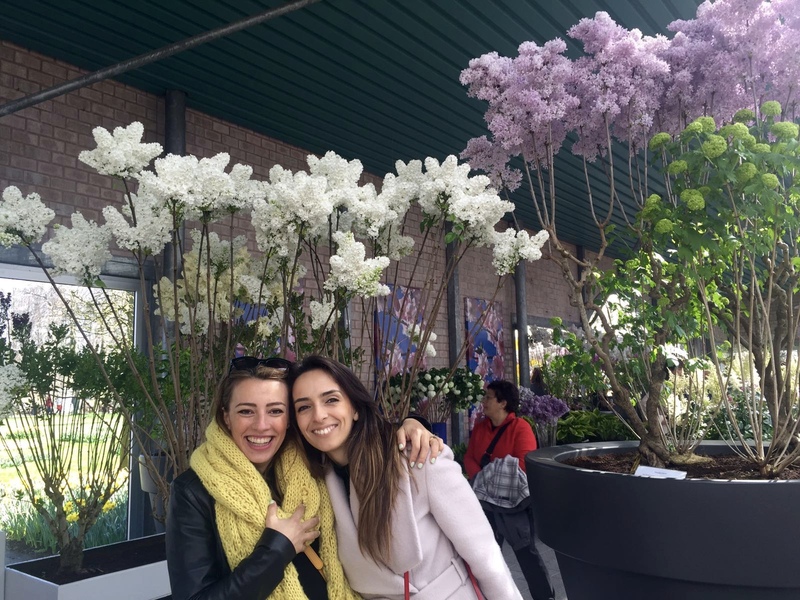 While there are times you may not feel like exploring your own city or country (usually because you got a bit too ‘accustomed’ to your surroundings and may feel like you’ve seen it all), everything changes when you have friends and family coming over. Suddenly you get an incentive to do all the things that you may consider touristic, just because you want all of you to explore something new together. 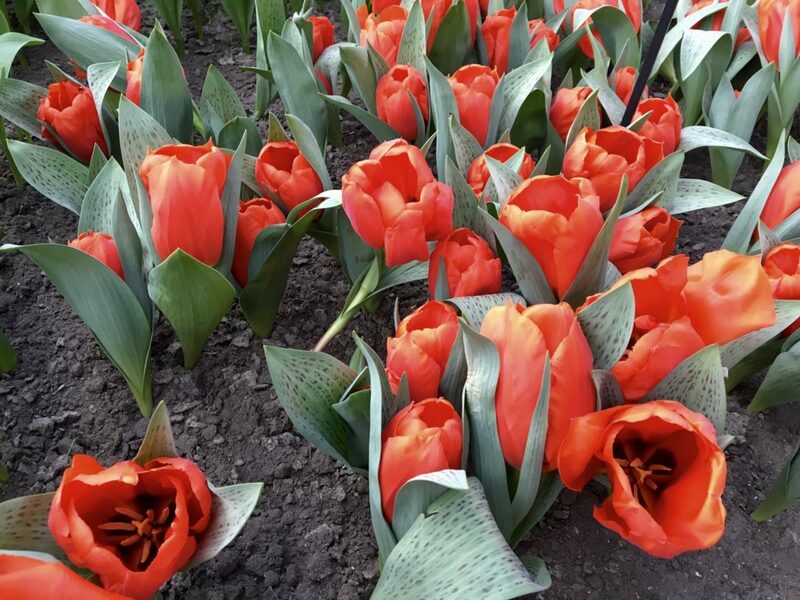 Last week, extremely happy about having friends and family over, I planned two trips in the Netherlands: one to Giethoorn (that my parents had read about and were very eager to see) and Keukenhof (the beautiful tulip fields I had visited four years ago and which I really wanted to return to. This time I had the perfect reason). So, while we had a lovely time exploring both of these two locations, I’ve decided to write this article to let you know what to expect while going there including some tips for planning your trips. I’ve tried my best to give you just the ‘right’ amount of details and not disclosing too much, so you can have your own surprise element. Luckily, we planned this trip on a sunny day. I suggest you do the same, as you’ll surely enjoy the surroundings more. I don’t think our experience of Giethoorn would have been half as nice on a rainy day, for example. When you get to Giethoorn, it’s best if you park your car close to ‘t Zwaantje restaurant. Just next to it, you can purchase boat tickets or rent a boat. You’re already settled to start your day now. 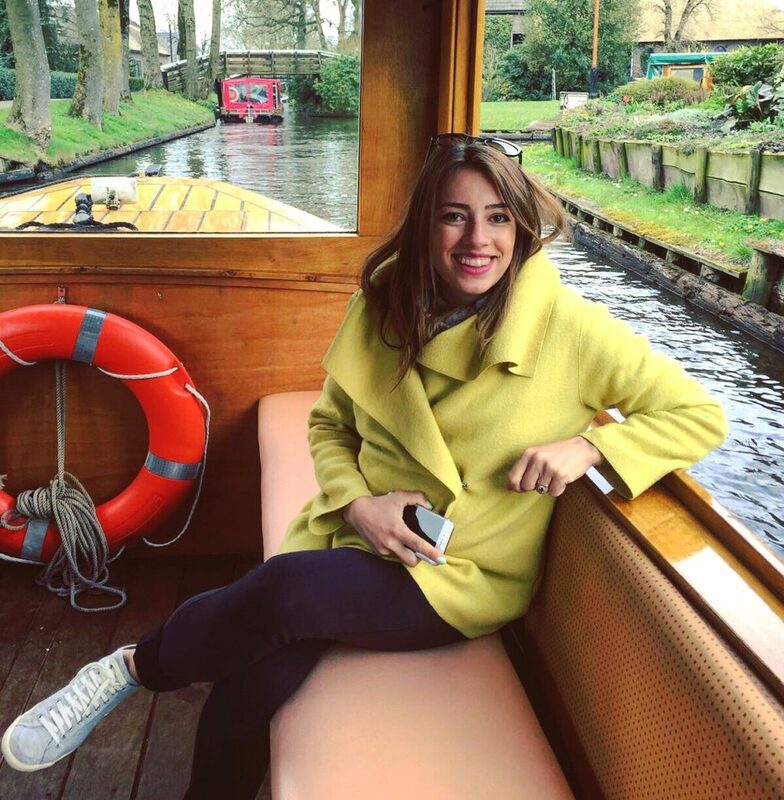 From our experience, it’s best if you start with a boat tour, as you’ll be exploring the nicest parts of the village and you can even choose a lunch spot for later on or make some plans of where you’d like to have a walk afterwards. The village is absolutely fantastic. 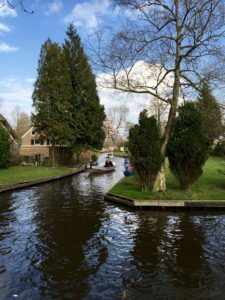 You are surely going to love going by boat through the narrow canals, looking at the cutest, whimsical little Dutch houses. What I would advise though is choosing for a one-hour boat tour, rather than a two-hours one. The village is so small, that you will find one hour to be enough to cover the most beautiful parts of it. After the tour, it’s nice to just have a walk on the canals, and stop at one of the canal terraces for afternoon lunch or tea, while enjoying the views. On Presi’s sweet tooth cravings kicking in, we all ended up our trip enjoying the most humongous ice creams we’ve ever had with some of the most ridiculous toppings. I can’t really recall on which one of the streets this ice cream place was, but you’ll surely not miss it, as all the boat tours pass by it. 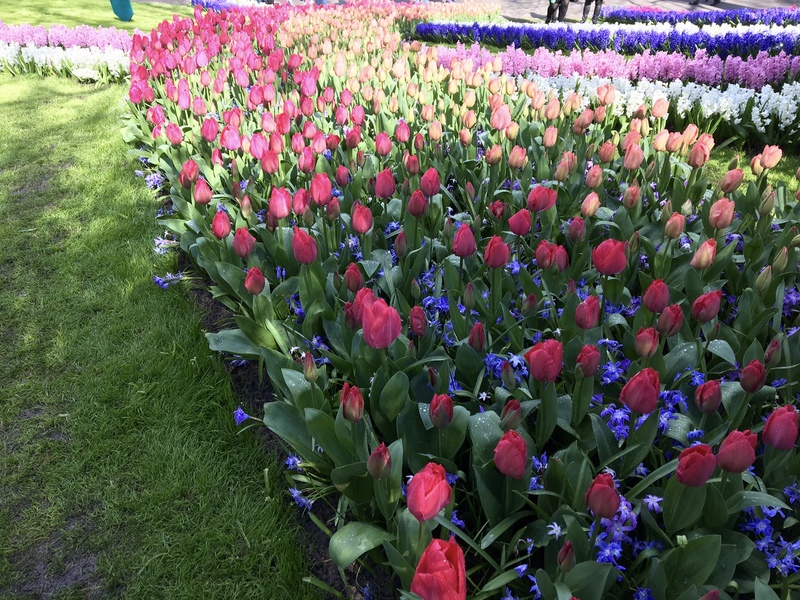 If you visit the Netherlands during the tulip season (end March to mid May), you’ll most probably want to visit Keukenhof – the beautiful park, filled with endless tulip fields and lots of other spring flowers). But mind this: if you are a person who doesn’t usually want to venture in touristic attractions or is an enochlophobiac (fear of crowded places), for your own piece of kind and health, you should pick a date that is not during weekend time ;)) This place can be extremely packed. 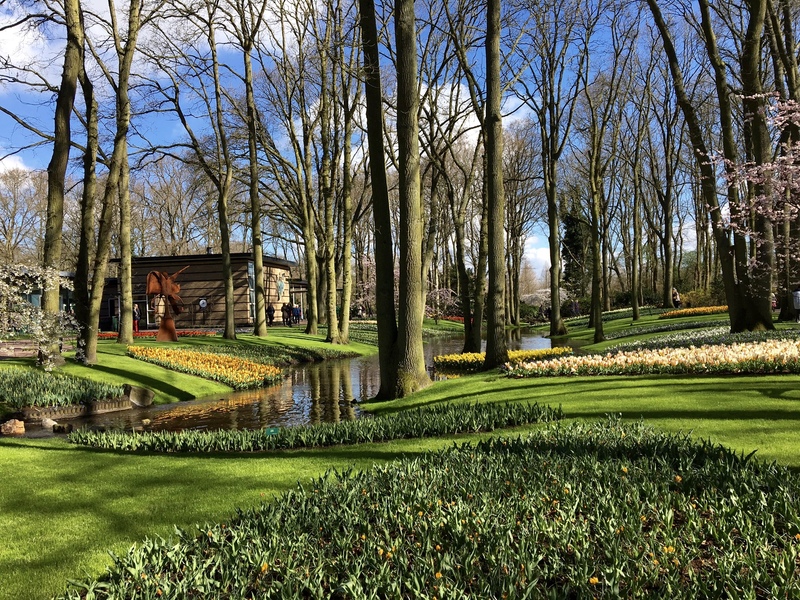 So, while you may want to take a romantic picture of you and your loved one alone, surrounded by tulips and hyacinths, then it’s just wishful thinking ;)) Arm yourself with loads of patience if you visit Keukenhof on a busy day. This would be the only small downside of going there. Every year they have a theme for the park. This year it was the Golden Age and they had a separate flower exhibition dedicated to it. We had an amazing day and have seen the most gorgeous flower fields. The pictures speak fro themselves, I guess. Not to mention having seen tons of tulips types we’ve never seen before. And one of the coolest things is their name. Before you know it, you’ll be walking around the Kings of Leon tulips, the Bulldogs, Queens of the Night, Laptops, Barbados, Magic Lavenders and the Black Jacks ones. Some of my favorites were these ‘piggy’ ones (left-hand side). Even if I cannot recall their name, they’re still in my top. If I were to name them, it will probably be something along the lines of: Piggy-Ate-Too-Much Tulip ;)) They are short and bulky, not to mention goofy looking. There’s not much to say about this place, except that I think you would totally love it. And, even if you are not a person who loves flowers, I cannot imagine how someone wouldn’t enjoy this place. I would go to the extent of calling it heavenly. Next time you’re in the Netherlands and especially if around springtime, don’t forget about these two locations, which you’ll surely enjoy. They are very unique, thus I find it hard to believe you would have been to similar places before. 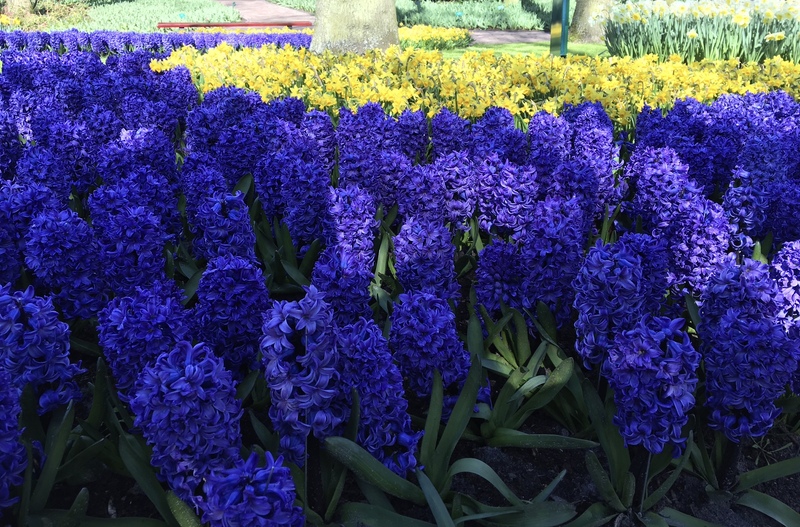 For those of you living in the Netherlands – what are some of your visiting tips during springtime that we can share with the visitors coming over?